Last month my husband and I took our yearly “leaf-looking” drive. One Saturday each fall we hop in the car and spend the day searching out trees displaying hues of stunning reds, burnt oranges, and bright yellows. It’s one of my favorite days of the year. We landed in a town an hour and a half away. After our lunch in their local Mexican restaurant, I couldn’t help but notice the cute boutique across the street. Its windows were filled with everything autumn, and what caught my attention the most was the chalkboard sign on the sidewalk in front indicating they had the “best caramel apples” inside. It didn’t take long for me to learn this would become my new favorite place to shop. On-trend clothing styles, reasonable prices, unique gift items, and yes, the best caramel apples around. But, what I appreciated the most was the story behind it all. The lone sales clerk gave us the highlights. The owner had become unemployed, and after some passing of time, she decided to follow her dream of opening her own store, and voila! I was standing smack-dab in the middle of another woman’s dream. Many years ago I learned a valuable, truth-filled tip. When you help another achieve his or her dreams you are better equipped to achieve your own. I may not have helped this unknown woman achieve her dream, but after learning her story, I knew I wanted to help her continue it. I believe each of us has a dream that’s buried inside of us. Some of us have buried it so deep, we’ve forgotten all about it. Some of us are too scared to let it free, because goodness, what would happen if it grew wings? And, some of us see reality and it appears our dream has no place in it, so it’s better left tucked away. I believe each of us has a dream that’s buried inside of us. But, not this woman. Not this beautiful boutique owner. She was brave enough to let her dream free, and it grew mighty wings. I could guess how much her dream blessed her community there on the corner, but it also blessed me who happened upon her store–and her story–one Saturday afternoon in October. Choosing an army green vest and a tie-dye cold-shoulder blouse (and a caramel apple) was my way of helping her continue her dream. You can bet each time I wear these items I think of her and rejoice. 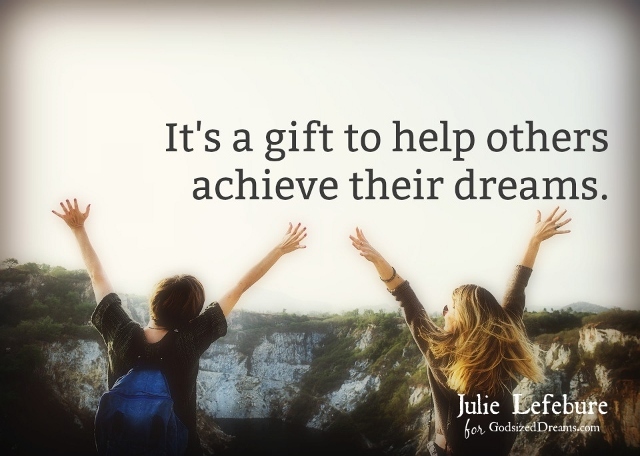 I’m reminded of what a gift it is to help others in their dreams. Helping others achieve/continue their dreams helps us achieve ours. Doing so provides us an awareness of our own dreams. If someone else can do it, so can we! It spurs us on to treat others as we want to be treated. We’d all appreciate someone helping us achieve our dreams! As we bless others in their dreams, we can’t help but be blessed in return! There’s just something about coming alongside another in his or her dream. Look around you today. Who can you support? Who’s the one who might benefit from your encouragement? The mom and pop grocery store around the corner? The photographer who’s just starting his business? Maybe the woman who is stepping out into ministry? Or, maybe it’s the child knocking on your door to sell you a tin of popcorn for school. Let’s be about helping others achieve their dreams. Let’s do all we can to help others succeed. I hope to meet this woman someday. I look forward to encouraging her in person. Even though her boutique is an hour and a half away, I plan to return again soon! And, hopefully, they’ll still have caramel apples! Julie, thank you for sharing such an encouraging word, no matter what our role is in the story! No matter which side of a dream we’really on, God has work for us to do. Prayers for partners to come alongside you in your dreamweaving. Alice, thank you for your prayers! I’m thankful for partners and encouragers like yourself to come in just at the right time. May we never tire of doing His work! I love this story! Too often we see one another as competition and jealousy takes the wheel. Instead of supporting one another we become cold or gossip or choose to let jealousy win. Your encouragement to support one another is so important! When we support one another we are being a blessing. We are looking outside ourselves to see what someone else needs. It’s beautiful! Hi Becky! You are so right. It is beautiful to look outside ourselves and do what we can to help another. I wish it just came naturally for me to always do so. I appreciate your thoughts here… they spur me on to keep looking for ways to bless others. Thank you! I love what Becky said, above! As dreamers ourselves, it’s so healthy to view the world around us in terms of dream fulfillment and to be open-hearted in promoting the dreams of others! Thanks for sharing this beautiful day with us, my friend. Yes, Michele. It is healthy for us to do so! I wish I would have learned this sooner in life. So glad we can encourage one another and learn from one another as we walk our paths of life. Thanks for being one of those people for me! Thank you Julie for your encouraging words. Coming alongside someone else to support their dream is a way to grow them and us. I like how you shared helping others achieve their dreams helps us to achieve ours. Great lesson. Hi Mary! God continues to teach me “do unto others as you would have them do unto you.” This was a big part of another great lesson of His. Plus, it’s fun helping others achieve dreams in both big and small ways. Thank you for always helping me when I ask, Mary! What a lovely way to spend the day with our mates and help someone pursue their dream, Julie! Thanks for sharing your experience and challenge with us today. Hello! It truly was a blessed day. It awoke me to the idea of seeking out others to bless in their dreams through the holiday season too. So glad you stopped in! Julie- yes, it’s true. I’ve seen this truth in action! I also love the owner’s story of hardship leading her to the fulfillment of her dream! Sometimes the things we view as negative, are really a HUGE positive in disguise! Hi Rachel! Yes, her hardship is a beautiful part of this story. I hope to find out more details from her some day. It reminds me to look for the blessings in what appears to be negative. Thanks for sharing your thoughts! So true! When we cheer each other on it leaves no room for comparison and jealousy. Sometimes I have to remind myself, my story isn’t hers, and that God has everyone on their own path. Alecia, isn’t that the truth?! I believe it glorifies God when we cheer others on, or better yet, even help them in their dreams. We can rejoice we each have our own path to travel and be thankful we aren’t alone on it! What a great idea to help others achieve their dreams. It is strange but when I do that it actually becomes my dream too and it encourages me to follow my own. Yes! It’s interesting how that happens! Watching another’s dream come true gives us hope. Thanks for sharing your thoughts today! I love Julie and admire her tenacity. What a lovely tribute to a dream – a stranger’s dream! Such kindness. Dream Because of Your Children!